The Home of NO Dealer Added Fees! 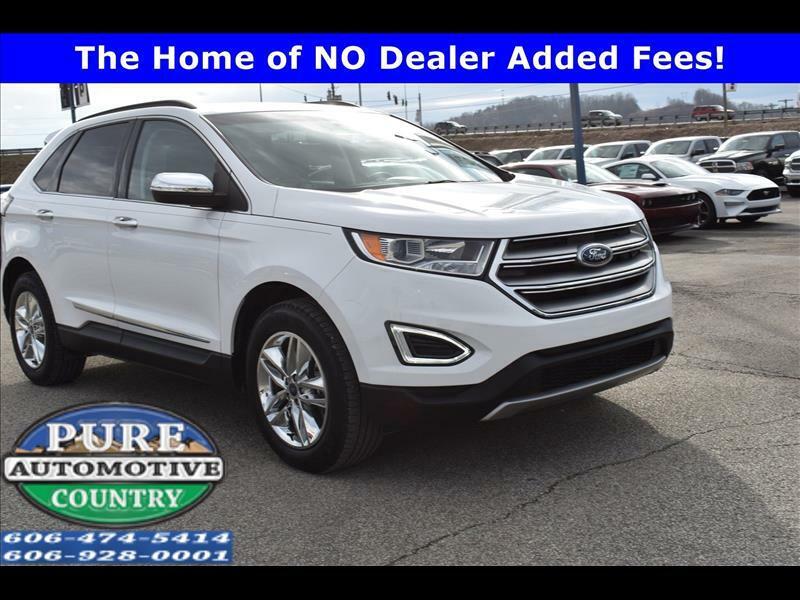 Visit Pure Country Automotive online at purecountryauto.com to see more pictures of this vehicle or call us at 606-928-0001 today to schedule your test drive. Message: Thought you might be interested in this 2015 Ford Edge. Pure Country Automotive Outlet (hereinafter "Dealer") is an automotive dealer located at 5972 US Route 60 Ashland, KY 41102. This Site is licensed and operated by Pure Country Automotive Outlet located in Ashland, KY, 41102, which is an automotive dealership operation or related dealership marketing entity consisting of the dealership(s), make(s), vehicle inventory and/or marketing content represented in this Site and its subsidiary Sites. The information within this Site is provided "as is". No warranty is expressed or implied to the fullest extent permissible by applicable law. Pure Country Automotive Outlet and any of its providers of information do not warrant error-free or uninterrupted service of this Site. Please note that this Site is operated in Ashland, KY and therefore all Disclaimers are predicated on applicable KY or country laws and standards. Visitors from outside KY or country should be aware that Pure Country Automotive Outlet makes no representation that this Site and the information contained herein is appropriate or available for use in other areas. Those who enter this Site from outside KY or country do so at their own initiative and are directly responsible for compliance with their local laws to the extent those laws apply. All vehicles are sold on an "as-is" basis unless stated otherwise. All prices plus sales tax and shop supplies where applicable. Picture may not represent actual vehicle. Prices and special offers are subject to change. Mileage listings are estimates and are not necessarily accurate odometer readings. Some vehicle information and vehicle pricing may be unintentionally missing or inaccurate, and Pure Country Automotive Outlet will endeavor to correct such discrepancies in a commercially reasonable manner upon Customer notification of such errors or omissions, but pricing errors and listing errors are considered invalid and may or may not be honored at the sole discretion of Pure Country Automotive Outlet and its participating dealerships. Payment calculator should not be used for exact finance amounts determined with approved credit. Daily changes in inventory may result in the unavailability of certain vehicles listed on-line. A commercially reasonable effort will be made to keep the inventory database current on a multi-week basis. Pure Country Automotive Outlet located in Ashland, KY, 41102, is generally an automotive dealer or related dealership marketing entity that may or may not be one or more of the following: car dealer, auto dealer, truck dealer, new car dealer, new car dealership, new truck dealer, new truck dealership, luxury vehicle dealer, special finance dealer, used car dealer, pre-owned dealership and/or pre owned dealership; such that Pure Country Automotive Outlet is generally in the business of selling new cars, new trucks, new SUV's, sport utility vehicles, used cars, used trucks, certified pre-owned vehicles, certified used cars and/or other related automotive industry parts, service, after-market, F&I. If you use Text Messaging to or from this site, message and data rates may apply. Use of this Site may incur additional charges from your telecommunications provider depending upon your service plan with your carrier. Such charges will appear on your phone bill. Pure Country Automotive Outlet is not responsible for any additional charges you may incur as a result of use of this Site by text messaging. Pure Country Automotive Outlet complies with the requirements of Title V of the Gramm-Leach-Bliley Act, 15 U.S.C. § 6801 through 6810 ('GLB Act'), and the Federal Trade Commission's implementing regulation, Regulation P, 16 C.F.R. Part 313 ('Regulation P'), in particular, as both relate to the disclosure and protection of Non-Public Personal Information (NPI) for Customers with regard to the authorized distribution and intended use of Customer's financial information to other parties. Pure Country Automotive Outlet will substantially comply with the GLB Act and Regulation P for all Customer NPI received, transferred or obtained from the use of this site or from a party (a 'party' and collectively the 'parties'). In particular, each party may use Customer NPI it receives, transfers or obtains from a party only for the purpose for which the party delivered such NPI, and only for such other purposes permitted under 16 C.F.R. § 313.14 and 313.15. Whereas, by use of this site and its forms, Customer acknowledges that any information submitted may be utilized by BMW of Bowling Green for its intended purpose. We monitor site traffic for administrative purposes—for example, to ensure smooth site traffic flow or to assess what pages on our sites are visited the most and by visitors from which countries or Internet Service Provider (ISP) domains. To do this, our Web servers aggregate the anonymous information that your browser automatically transmits anytime you are on the Web. This website may use tracking tools, such as Google Analytics, to help analyze how users use the site. The tool uses "cookies," which are text files placed on your computer, to collect standard Internet log information and visitor behavior information in an anonymous form. The information generated by the cookie about your use of the website (including IP address) is transmitted to the tracking tool. This information is then used to evaluate visitors' use of the website and to compile statistical reports on website activity for the Company. The tracking tool will not associate your IP address with any other data held by the company. We do not associate any data gathered from this site with any Personally Identifiable Information from any source, unless you explicitly submit that information via a fill-in form on our website. We also may implement features based on Display Advertising (Remarketing with Google Analytics, Google Display Network Impression Reporting, DoubleClick Campaign Manager integration, and Google Analytics Demographics and Interest Reporting). Third-party vendors, including Google, show our ads on sites across the Internet. We, along with third-party vendors, including Google, use first-party cookies (such as the Google Analytics cookies) and third-party cookies (such as the DoubleClick cookie) together to report how your ad impressions, other uses of ad services, and interactions with these ad impressions and ad services are related to visits to our website.